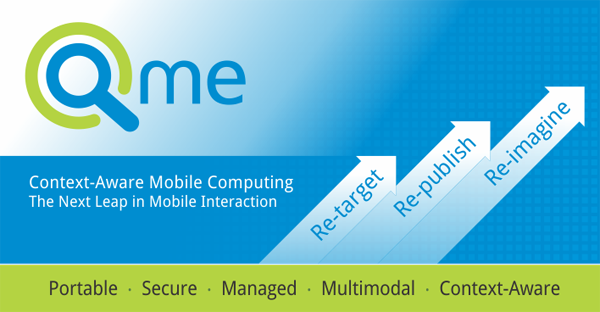 Cue-me™ is a Context-Aware, Multimodal mobile application development platform that enables natural interaction with applications in a device independent way. Mobile computing devices come in many shapes and forms - but the overarching requirement regardless of the development and deployment technology used, is Compelling User Experience. Context-Aware Computing (CAC) is the technology that provides the foundation for high quality User Experience across mobile devices and usage situations. Openstream's award-winning Cue-me™ CoDA (Context Delivery Architecture) is the only platform on which context-aware, multimodal applications can be authored, managed, secured, and deployed independent of the device/OS type. Such Context Aware solutions can fluidly manage various situational conditions to deliver the optimum interaction for the user. Context-Aware Technology examines and responds to a person's proximate environment. Context-Aware software is dynamic, and mediates people’s interactions with devices, computers, and sensors, delivering appropriate navigation and interaction for the given situation. Since the most interesting part of our world happens to be what we experience in our immediate, proximate environment with touch, sight and sound (feel, see and hear) we have developed a platform that enables Enterprise applications to be rendered context-aware. Multimodality is second nature to human beings. We process information from our environment utilizing the appropriate modality of interaction. For example, we prefer to use visual cues in a noisy airport environment. We may want to use voice when it is difficult to type. We may want to connect to other computing devices in the proximity. The ability for applications to use the appropriate modality of interaction in a given situation is called Multimodal interaction. Openstream is spearheading the development of world standards for Multimodal Interaction at the W3C® Multimodal Interaction Group. In a Context-Aware, Multimodal environment, mobile applications need to respond to several cues from the environment. Running within the Cue-me™ platform, Enterprise applications can automatically receive, manage and respond to these cues in a manner commensurate with the situation. Enterprises can now execute a multi-pronged mobile enablement strategy, and take advantage of the convergence of multimodal and sensory technologies, manipulating and moving data fluidly at the point of activity. Context-Aware technology ensures better productivity, and maximizes the efficiency and efficacy of mobile deployments. What can Enterprises do with Multimodal Context-Aware Cue-me™? Re-target: Morph existing web applications with rich interaction and local execution features, and enabling delivery-context-based adaptation. Re-publish: Convert web applications into rich applications deployable on any device, with Multimodal UX, while re-using existing back-office services and applications. Re-imagine: Introduce context-aware navigation to applications enabling them to dynamically adapt to the application's flow based on the User's Situational Context. Time to market is critical for Mobile Application development and delivery. And so the choice of the right Mobile Application platform is important to you. Serial disruptive innovation in the mobile space has certainly not made it easy for Enterprises evaluating Mobile Strategies. In this rapidly changing landscape, what path can Enterprises take to ride the mobile innovation curve with the least amount of pain?